Please contact us for details on pricing and how to buy this item. See if any specific sizing guidance is given in the product description below. If not, use this as a general guide. For the best fit we recommend that you use the Chest, Waist and Shoe size measurements where provided. The chest to fit sizes given are the chest measurements of the wearer that the garment is designed to best fit. Measure around the chest at the fullest part with the tape placed just below the under arm. The waist, length and inside leg sizes listed are actual garment dimensions. Free UK delivery applies to non-badged orders over £85.00 in value. For all other orders, a small charge (£2.50 - £5.95) based on parcel weight will be levied at the checkout. Please refer to our P&P Guide for current postal and shipping charges or request a quote at the checkout. For your assurance, we use Stripe and PayPal to handle all your credit or debit card transactions. Stripe and PayPal are both a reputable and safe means to purchase goods online and you do not need an account to use them. Your transaction will be secure and we do not receive or store any of your credit or debit card information. Please contact us should you require a size smaller or larger than the size range listed above, and we will endeavour to make it available. Made from 100% polyester with moisture management fabric, the shirt has side vents, elbow length sleeves & contrast piping detail & inner placket. 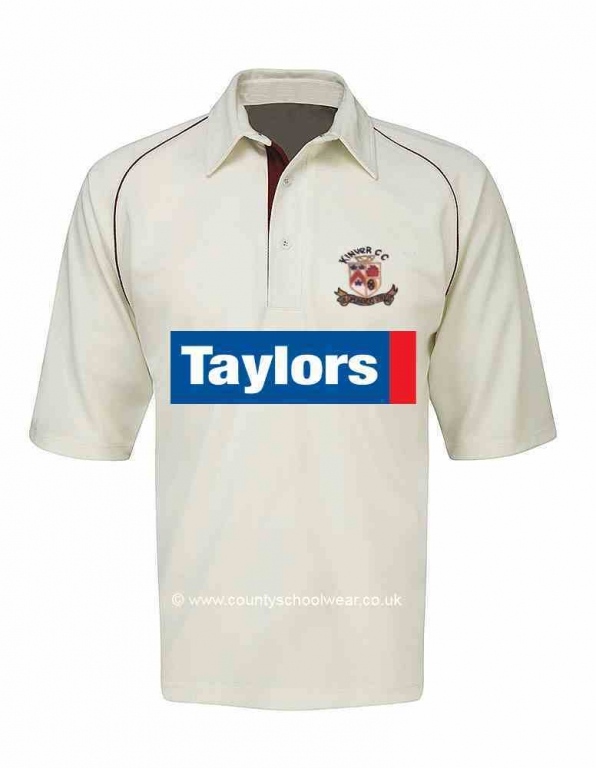 Embroidered with Kinver Cricket Club crest and includes sponsor print.